OPPORTUNITY KNOCKS!! Treat yourself to dynamic SUNSET AND BAYVIEWS to gain a true sense of what being AT THE SHOREis all about! Enjoy Beach by Day and Relax on Oversized Deck Viewing MAGNIFICENT SUNSETS Til Night! This Wonderful Top Floor Condo offers Tranquility as soon as you walk through the front door with a bright and open layout directed towards your scenic backdrop. Featuring 3 Bedrooms and 2 Full Baths, Amenities also include Master Suite with Private Full Bathroom, Cathedral Ceiling, Central A/C, Dining Area plus updated Kitchen Counter for Additional Seating, Attic for Storage, Large 9X 20 Deck with Vinyl Rails and Electric Awning. This unit has been extremely well maintained with several improvements including completely New A/C system in 2011, Windows in 2010, All new Appliances in 201 including a full size Stacked Washer/Dryer. Did I mention in a Perfect Location only a short walk to the Beach, Fishing Pier, and Sea Isle Citys Popular Play by the Bay with Tennis and Basketball Courts, Playground and so much more! 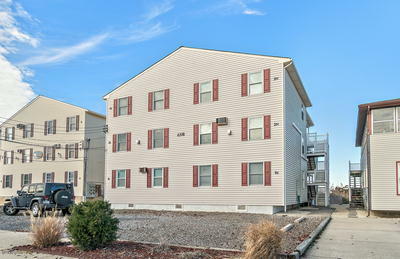 Unit is being sold fully furnished and equipped, not a rental but has enormous rental potential. Call to Schedule a Viewing Today! Additional details are available! Please contact us for more information. Copyright © 2014 · Information found on this web site is deemed accurate but not guaranteed.